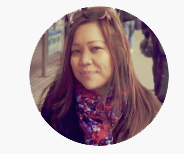 Four days and counting…we’d be back home, to enjoy fresh mangoes, pineapple, papaya, soursop and coconut flesh…I too look forward to all our local delicacies especially seafood grilled golden in charcoal! For our remaining days here, I’m savaging the freezer so that it gets rested while we’re away. I found tuna, shrimps, surimi and salmon, just perfect for teppanyaki. I just included yellow and red paprika and there’s our skewers. 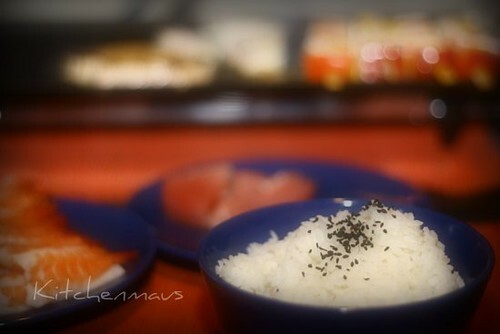 Rice is inevitable, I still have some japanese variant so this is just perfect for sushi rice…the kids enjoyed theirs with nori bits while I sprinkled hubby’s with black sesame seeds. They look just great, Now I have to raid the fridge!!!!! wow,looks delicious. salmon is my favorite fish. 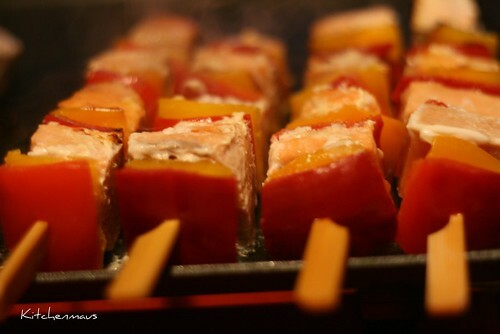 Salmon and peppers have a look of great taste, blackened and caramelized a bit for the ultimate in flavor. Colorful in hue, I’d enjoy a few kabobs for dinner tonite! I could already smell the yummy goodness! hi sis, thank you for playing along! your quote is nice – parang more than one entry na abng prawns ngayon ah. anyways, welcome back home and enjoy the vacation!